In glass with a polished or gilded chrome-plated metal border. 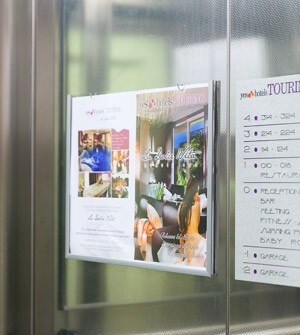 This sign holder is available in two different dimensions able to hold information sheets in format A3 or A4. The product is fixed to the wall by means of a bi-adhesive backing. It is suitable for posting anywhere including the inside of a lift. Here is our wall mount sign holder.